Old-fashioned courtesy seems to extend to all and sundry in Mexico, and in so many diverse ways. Perhaps most surprising is driving etiquette! Yep! While we all appreciate that the Mexican rules of the road are simply ‘guidelines’, elemental politesse dictates that in slow-moving traffic everyone stops to allow someone to pull out of a side road. Walking around town an ‘hombre’ will always step into the road off a narrow sidewalk to allow a woman to pass; everyone you pass in the street smiles and says “hola”, “buenos diaz/tardes” or “adios” – the latter not simply translating into “goodbye” (which at first seemed a little bizarre as a passing salutation), but, literally, ‘go with God’. What is bloody annoying, however, are the gringos (usually ‘snowbirds’) who arrive and seem to feel they are immune to traffic regulations and then post indignant complaints on Facebook or other social media about what they see as harassment by local law enforcement officials. For example, the many visitors who fly down to their second homes and keep golf carts as their only form of transportation then blatantly flaunt the law. YES! If you want to drive on a highway, motorized vehicles (whatever their shape or form) are expected to be licensed. The local police had field days just after the Thanksgiving weekends (Canadian and US) by waiting outside Walmart with a vehicle transporter, impounding all the unlicensed golf carts driven by newly arrived expats that exited the parking lot straight onto the highway! Seat belts also seem to be another subject of high dudgeon, with furious rants from gringos airing a multitude of excuses after being stopped and fined for not wearing one. There is NO excuse and, therefore, no cause for complaint if you insist on breaking the law and don’t expect it to be enforced if caught. One guy vented his fury on Facebook recently, protesting that his not wearing a seat belt was akin to Mexican families riding unsecured in the back of open pick-up trucks. Of course, seat-belt laws only apply to the interior of vehicles, and there is still at least one Canadian province (SK, I believe) that does allow riding in the back of trucks in extenuating circumstances. I would say, therefore, that Mexican families with only one vehicle – a truck, perhaps dictated by professional needs – might similarly be regarded as extenuating circumstances! In some cases, Mexican driving laws actually seem more sensible that their northern neighbours. For instance, teenagers are not allowed to drive without adult supervision under the age of 18. The legal limit for driving under the influence of drugs or alcohol is the same or stricter than many Canadian/US provinces or states…. To name just two. Interestingly, a regular sight on the roads is whole Mexican families riding on one moped: two adults, each with a child on their laps, plus a chihuahua – no one wearing a crash helmet. A sweaty-palms scenario, although the combined weight seriously limits the vehicle’s speed and it’s not uncommon to see them overtaken by pedal-powered bicycles! Supermarket prices still continue to amaze me every time I shop. Just two days ago I stopped to buy salad provisions: three different types of rooted, organic lettuce, a pound of tomatoes, a couple of yellow peppers and avocados – and received change from the equivalent of $5.00 at the checkout. Fruit is also plentiful and cheap –mostly organic, as well as year-round: a 16oz container of raspberries for around $1.30; strawberries, blackberries, figs, pineapple… you name it, all around the same price! A visit to our chosen veterinarian (US trained, bi-lingual, highly competent and an all-round lovely guy who spends many weekends offering ‘free’ spaying and neutering clinics for street dogs), certainly doesn’t crank up the same level of financial fear! Our young golden retriever was spayed last week for a grand total of less than $100, including all the usual post-operative drugs and medications. Finding a good hairdresser can be almost as painful as finding a good doctor or vet, especially if you’ve ever experienced a cut that suggests the use of garden shears!!! Recommendations are always good and, after one false start at an expat salon to which we’d never return, we’ve really lucked out with a Mexican guy – Los Angeles trained and a Hollywood escapee, no less – who returned to his home state three years ago to start his own business. It’s a one-sink, two-chair salon where he’s rushed off his feet from morning till night, and spends his off-duty hours at a local orphanage mentoring teenage boys. A two-hour visit including wash, cut, highlights, blow dry (which looked absolutely fabulous, by the way) for the equivalent of $23.75!!! Okay – shopping locally is great, but we can’t deny that we’re also grateful to have a Costco on the south side of Guadalajara, with pretty much the same floor plan and products as every other Costco in North America. But, with an additional, you-name-it-they’ve-got-it liquor department. Have, so far, found only a couple of missing luxuries: Tetley tea and liquorice cigars – which we’ll encourage any Mexico-bound visitors to tuck in their suitcases. Well – opening night last Friday followed nine weeks of rehearsals (including a week devoted to dress rehearsals – highly necessary with 12 costume changes, plus one hair and make-up transformation, and three ‘preview’ nights) – and what an adventurous performance it was. A power interruption caused by high wind in Act II resulted in only a momentary black-out until the emergency lights came to life – and, fortunately, it was only an interruption as the stage spots were restored within five minutes. Our wonderful cast didn’t miss a beat – after a few well-chosen improv lines that bridged the black-out. Now, four performances down, six to go – and enjoying a day of rest, apart from catching up with blog news. Back on stage tomorrow evening. So far, the production couldn’t have been better received by our very enthusiastic audiences – including a standing ovation at one ‘preview’ night. 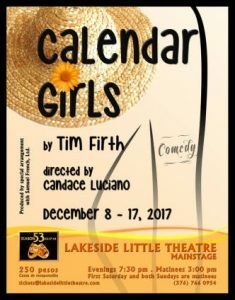 And, the Calendar Girls are being recognized around town! Popped into the local supermarket yesterday evening following the afternoon matinée and was accosted by two people who’d already seen a performance and wanted to say “hello” to ‘Ruth’! If anyone would like to buy a calendar, just let me know and I’ll gladly mail them. The photos are fabulous – taken by a career fashion and portrait photographer who retired to Ajijic a few years ago. Yes, many of us were naked for the photo shoot – maintaining our dignity with the judicious use of traditional WI props, per the original CG calendar. Sadly, the photos have been embargoed – apart from the cast photo below – until the production closes, so unable to give you a pre-purchase taste. Proceeds are going to support the pediatric leukemia and lymphoma department of Guadalajara’s ‘sick kids’ hospital – so a very worthwhile cause. The cure/remission rate has increased from 35% in 2007 when the current head of oncology arrived, to 85% today. This guy is the Mexican equivalent of Patch Adams, and encourages kids to attend treatments as their favourite super- heroes – when he and his staff are also similarly attired. My suggestion, if there are several Gabriolans wishing to purchase a calendar, or two, is that I’ll buy them and courier them to one address for distribution – and you can individually or collectively reimburse the cost directly into my CCCU bank account. The calendars are 250 pesos (just under CAD$17). Please let me know by the end of this coming week as we’re expecting them to be sold out by the final performance next Sunday, December 17. Our sales pitch is that there is no age limit to stripping off, and gives friends and family a taste of the fun you can have here in Mexico!!! So good to read your post Jean. I am learning about life in Mexico that I would never know otherwise. Just great and enjoying your blog so much.